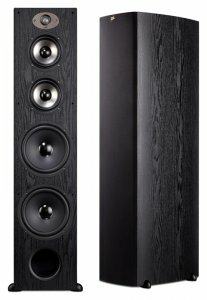 Polk Audio Tsx 550T (each) (black) Polk Audio Tsx 550T (pair) (black) - $335.95 : New Audio & Video, New Electronics at Lowest Prices! high performance floorstanding loudspeaker make it the perfect addition to any room, and any demanding audio system. super stiff, with exceptional damping, for high efficiency and low distortion. Big bi-laminate woofer drivers, with durable rubber surrounds, enhance low frequency response with accuracy and depth. turbulence of port air flow, to reveal full-bodied bass that blends effortlessly with the speaker’s overall dynamics. blending effects in multi-channel systems. delivering a performance that’s spacious and clear, natural and realistic. frequency details); these are usually found only on much more expensive loudspeakers. quality tests, including drop testing, extreme signal response and UV & salt exposure testing. Polk loudspeakers are built to perform for a lifetime.